[Lord Castlereagh, Tory Foreign Secretary at the Congress of Vienna, hated by Byron and Shelley.] 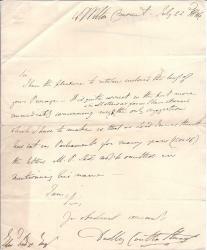 Autograph Letter in the third person, as 'Lord Londonderry', asking him to present a book to the king from 'Monsieur de Martens'. 'St James' Square | 1 May /22 '. 2pp., 12mo. On bifolium. In good condition, lightly aged. Reads: 'Lord Londonderry presents his compliments to Mr Watson and begs to forward to him a letter and book which he has been requested by Monsieur de Martens to present to His Majesty'. Londonderry was considered a repressive figure by the radicals. In a poem Byron called on travellers to piss on his grave, and in 'The Masque of Anarchy' Shelley wrote: 'I met murder on the way, | He had a mask like Castlereagh.' Within months of the present communication Londonderry would commit suicide. [ Mrs Molesworth, children's writer. ] Autograph Signature ('Louisa Molesworth') on valediction to letter. On one side of a 2.5 x 11 cm slip of paper, cut from the end of a letter. Reads 'Yours very sincerely | Louisa Molesworth'. [ Lord Castlereagh, Tory politician. ] Autograph Signature ('Castlereagh') on frank addressed to Captain Wood, 10th Hussars, Kilkenny. 'London June Twenty Four 1833'. On 7.5 x 12 cm piece of paper, cut from the front of an envelope. With frank postmark in faint red ink. Laid out in the customary fashioin, with the date and address reading 'London June Twenty Four 1833. | Captn. Wood | 10th Hussars | Kilkenny', with 'Castlereagh' at bottom left. [ 'The Hudson Case'. ] Manuscripts of Elliot's defence of Russell and Sir Henry Elliot in controversy over Italian ambassador Sir James Hudson, including 'unpublished part', letters by Countess Russell and Sir Henry Elliot, annotated pamphlet. [ London. ] 1881, 1885 and 1886. A son of the Earl of Minto, Elliot (hereafter GSE) was Russell's brother-in-law and one of his two executors. The events described in the present collection occurred while GSE was living with Russell, who was then Home Secretary, as his private secretary; and the controversy is over the claim that the replacement of Sir James Hudson as Italian ambassador by GSE's brother, the future Sir Henry Elliot (1817-1907), was an 'act of nepotism' on the part of Russell. pp., 8vo, paginated 285-300. Stitched into grey printed wraps. On aged and chipped high-acidity paper. Inscribed at head of front wrap: 'With the Compliments of | William J. S. Lockyer | 28.VI.01'. See Lockyer's obituary in the Monthly Notices of the Royal Astronomical Society, vol.97 (1937), pp.275-277. The only copies on OCLC WorldCat at the British Library and Observatoire de Paris. [ Benchara Branford (see ODNB) annotations; book ] Branford's copy of Cargill Gilston Knott's 'Life and Scientific Work of Peter Guthrie Tait', heavily annotated by him, mostly with references to 'this genius' James Clerk Maxwell. Book published in 1911 (Cambridge: at the University Press). Annotations dated by Branford between 1934 and 1943. 4to: x + 379 pp. Frontispiece and plates. Tight copy on aged paper, in worn binding. Annotated throughout, with the endpapers and almost every page of the first 146 in particular crammed with notes by Branford in pencil and pen. On the front free endpaper Branford writes 'Finished (fairly thoroughly) on Feb. 26th 1934', and on the title-page, 'B. B. Sep. 3d. 1943'. On the same page he has added to the title 'and many notes (additional to those in text) on his intimate & great friend James Clerk Maxwell [...] the notes being taken from his Life by Campbell & Garnett'. [ A. J. Hall and Dr. James Stewart. ] Autograph Note Signed [ to Dr James Stewart ] by the Irish singer A. J. Hall, with biographical 'Memo. by Dr. James Stewart ("Sheamus Rua")'. Note on letterhead of the Junior Athenaeum Club, 116 Piccadilly [ London ]. 18 November [ circa 1898 ]. Stewart's memorandum undated. The note and memo are on a 12mo bifolium. In good condition, lightly-aged. The letter is signed 'A. J. Hall' and addressed to 'My dear Doctor'. He explains that he would gladly visit him, 'if at liberty', but that he is 'at Wolverhampton that night with Madame Albani'. The biographical note, presumably in Stewart's autograph, is on the reverse of the second leaf of the bifolium, beneath the following, in red ink: 'Memo. by Dr. James Stewart ("Sheamus Rua") Hon. Secy. Liverpool: Geo. Smith, Watts and Co. [ 19 Titherbarn Street. ] 1853. 48pp., 12mo. Disbound with free endpapers.In fair condition, with light signs of age and wear. Nicely printed, with all edges gilt. Dedication 'To the Friends and Admirers of William Roscoe, assembled to commemorate theh Centenary of his Birth, this Edition of the Memoir, by Dr.
[ Pamphlet. ] The Repeal of the Union Conspiracy; or, Mr. Parnell, M.P., and the I.R.B. London: William Ridgway, 169, Piccadilly, W. 1886. 64pp., 12mo. Frontispiece in red and black, with diagrammatic pyramid with 'Rank and File or "Soldiers."' at the base, and 'C. S. Parnell, M.P.' at the apex. At foot of the frontispiece is printed 'The Assassination Oath of the I. R. B.' Disbound pamphlet without covers. In fair condition, on lightly aged and worn paper. [ Red Cross Gardens, Southwark, London. ] Draft manuscript indenture assignment signed by the Earl of Ducie, Lancelot William Bennett, Charles Stewart Loch, Mary Lumsden, Helen Ironside, Janet Johnson, Thomas Slingsby Tanner, Cecil Antony Nussey. [ Red Cross Garden, Southwark, London. ] Dated 15 August 1914. On three sides of a vellum bifolium supplied by the London law stationers Witherby & Co. Dimensions of leaf 39 x 26 cm. In good condition, lightly aged and creased. The document is a draft, with several emendations in pencil, including a lengthy addition in the margin of first page, and a shorter one on the second page. Laid out in customary style, within red rules. Docketed on fourth side: 'Dated 15th August 1914 | The Earl of Ducie and Others | to | The Earl of Ducie and Others | Red Cross Garden | Assignment'. With stamp of the Ecclesiastical Commissioners, signed by Hugh de Bock Porter. [Lieutenant-General Sir William Stewart.] 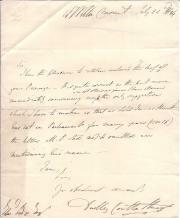 Autograph Letter in the third person from Major-General Stewart to his wine merchant Knobel of South Audley Street, regarding the sending of a hamper of wine and ale to Woodbridge, and an order for port. 3 Gloucester Street [London]. 24 July 1812. 2pp., 12mo. Bifolium. In good condition, lightly aged and worn. Addressed on reverse of second leaf, with Stewart's seal in red wax, to 'Mr. Knobel | Wine Merchant | South Audley Street'. He asks Knobel to 'send a person & a Hamper to pack up three dozen of wine & ale left at the Major General's for the Country, as before'. He asks for the hamper to be sent, 'so packed & sealed, together with 3 dozen hamper of His, (Mr. Knobel's) best Port ready for immediate drinking by the Hoy to Woodbridge in Suffolk, as last winter'. [Printed pamphlet.] Public Education in Northern Ireland. The New System. 7 +  pp., In grey printed wraps. On aged paper, in worn wraps, with rusted staples. Shelfmarks, stamp and labels of the Board of Education Reference Library. Scarce. [Printed pamphlet.] Speech by the Marquess of Londonderry, K.G. Minister of Education, Northern Ireland. On the Introduction of The Education Bill, in the House of Commons, Belfast. 14th March, 1923. 19 +  pp., 12mo. In printed card wraps. In good condition, on lightly-aged paper, with rusted staples, and shelfmarks, stamp and label of the Board of Education Reference Library, London. Scarce. [Printed pamphlet.] On the Value of the Edinburgh Degree of M.A. An Address delivered to the Graduates in Arts, April 24, 1866. 19pp., 12mo. Stitched. Disbound. In good condition, on aged paper. The address is headed: 'The Senatus, on the motion of Dr. R. Lee, agreed to request me to publish this Address. It is printed word for word as delivered, as I feel that though I might speak even more strongly than I have done, the object I had in view has been in some sense attained. - P.G.T.' Nine copies on COPAC and WorldCat, but only one outside Britain. [Victorian handbill satirising Lord Randolph Churchill, Gladstone and other members of the House of Commons, headed 'HOUSE OF COMMONS. | PROROGATION OF PARLIAMENT'. Without date or place, but accompanied by annotation in contemporary hand dating it to 1881. Printed in black on piece of purple paper, 27 x 14 cm. In good condition, laid down on a leaf removed from a contemporary album, with the date '1881' written beside it. The first paragraph sets the tone: 'LORD RANDOLPH CHURCHILL rose to ask Her Majesty's Government a question as to the state of Public Business, and the probable date of the Prorogation of Parliament. [John Campbell, 4th Earl and 1st Marquess of Breadalbane.] 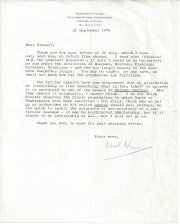 Nine Autograph Letters Signed to him, from various parties, most on estate matters, including five from his agent Duncan Campbell, several showing the hardships suffered by his rural tenants. From Ardvorlich, Edinburgh, Killin and Rockhill in Scotland, and one from London. Between 1803 and 1833. Eight of the items are in very good condition, on lightly aged paper, the ninth (Item Four) is damp-stained. One letter (Item Five) is incomplete. Five letters (Items One to Five) are from Breadalbane's estate manager (and kinsman?) 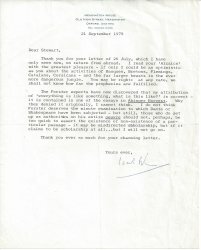 Duncan Campbell, and there are other letters from the latter's family. Autograph Letter Signed from the Irish nationalist writer and politician Justin McCarthy, sending Lady Dorothy [Neville] 'the only Souvenirs from Dublin of Parnell's funeral'. No place. 30 October 1891. On square of paper. In good condition, lightly-aged and with traces of glue from mount adhering to reverse. The letter reads: 'My dear Lady Dorothy | I send you - at last! - the only Souvenirs from Dublin of Parnell's funeral. I received them this morning. One represents the scene in the City Hall under the shadow of O'Connell's statue - the other the grave in Glasnevin. | With kindest regards | Very truly Yours | Justin Mc.Carthy'. The souvenirs referred to in the letter are not present. Autograph Letter Signed ('W F Butler') from Sir William Francis Butler, Irish officer in the British Army, to an unnamed correspondent, discussing the 'great mediaeval Sin' that was committed by the English in Ireland. 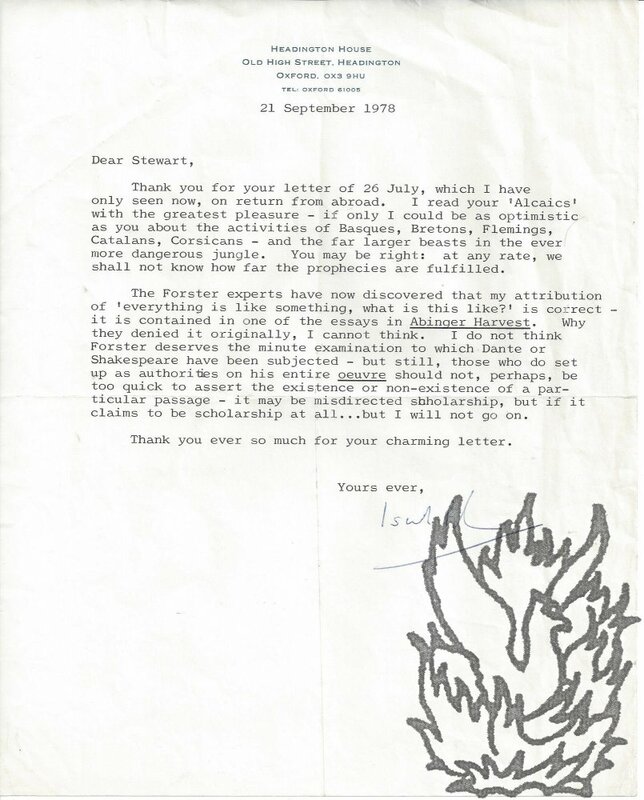 On letterhead of North Camp, Aldershot. 13 May 1894. 4pp., 12mo. Bifolium. Good, on lightly-aged paper. Addressed to 'My dear Sir'. England and Ireland are not named in the letter, but subject of the letter is clear from the context. He has read 'with very great pleasure' the pamphlet which the recipient sent him. 'You are correct in surmising that for the present at least I take no part in the political question of the day - but my views show no change'. 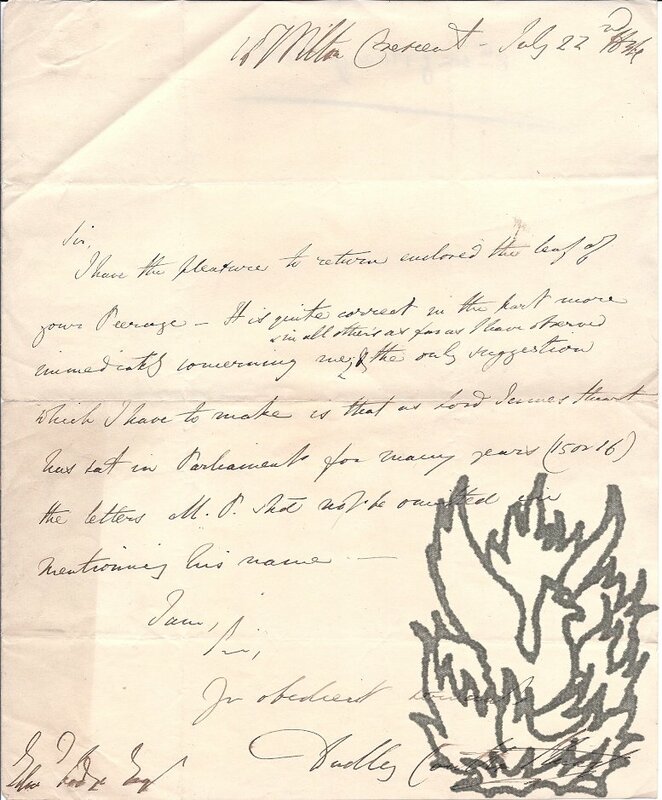 Autograph Letter Signed ('Stewart D. Headlam') from the Christian socialist clergyman Stewart Duckworth Headlam to an unnamed correspondent, discussing 'a dangerous modern mistake' in the interpretation of the Sermon on the Mount. On letterhead of Wavertree, St Peters Road, St Margaret's, Twickenham. 9 July 1902. 3pp., 12mo. Bifolium. Worn and with a couple of pinholes. His correspondent's previous letter included a statement which Headlam would like verified: 'I dont think the ordinary customer is quite such a fool as that statement implies'.